We believe that everyone has significant abilities which are often locked inside them. Our DROP THE ACT skills workshops are designed to tap into what’s great about you and build your practical skills. Since launching our original Communication Skills Workshop in 2007, Northern Stage has welcomed participants from organisations across the region, our clients ranging from high-profile companies and public bodies to SMEs and sole traders. With our training partners, Mortal Fools, we offer a range of workshops that exist as individual stand-alone training days or as part of a programme. Our skills workshops use practice from the creative sector to help participants to identify and build on their individual strengths and attributes, develop new practical skills and to support professional and personal development. Skills workshops are practical and encourage participants to feel, think and build skills through participation. There is almost no desk-based learning in our workshops and we hope it will be unlike any training you have done before. Whether you’re looking to develop your leadership practice, communicate more engagingly, or become more resilient, we offer dynamic and effective approaches for you and your organisation. Our training is delivered by experienced facilitators, directors and creative practitioners in an environment which is genuinely supportive and accessible. All our skills workshops are suitable for corporate groups or individuals. 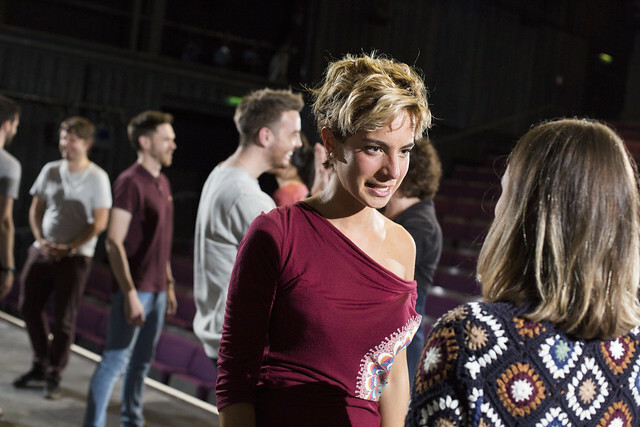 As well as our programme of 'open' workshop dates throughout the year which you can book onto, organisations can book an 'in-house' skills workshop for a staff group either at Northern Stage or your organisation's premises. If our existing workshops don’t quite fit your needs, we can also combine elements of workshops or design a 'bespoke' workshop to meet your organisation's requirements. It was great to develop skills and build confidence in such a dynamic environment. Fun and encouraging. I will take away a new confidence and self-empowerment. Best training I have ever been on! I have already recommended to colleagues and friends. Venue: Northern Stage, Barras Bridge, Newcastle Upon Tyne, NE1 7RH or in-house workshops at your organisation’s premises, by arrangement. Workshop duration: One day workshops, 9:30am to 5:00pm. Registration from 9:15am. Workshop capacity: 12-16 participants. The minimum group size for In-House or Bespoke workshops is 12. One day workshops include lunch & refreshments.